As you know, we've joined The Nester's 31 Days Challenge and it's Day 3 of our 31 Days of Simple Living series. 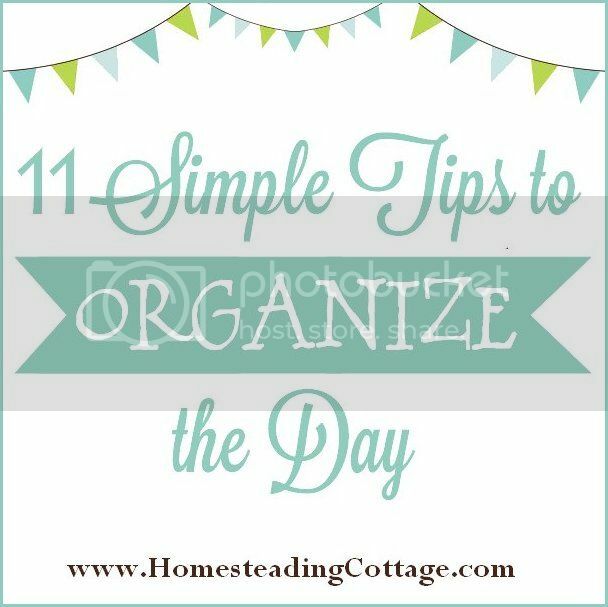 Yesterday we talked about the 7 Daily Do's and today I wanted to share 11 simple tips to organize the day. As a creative spirit, I can be all over the place. Ideas flow on a continual basis which means I get distracted A LOT! I used to believe that procrastination was the challenge, only to later realize it was because I wasn't filtering my days. 1) Plan the night before – Do everything you can to make the next day easier. Set out breakfast dishes, utensils, napkins and non-perishable foods so things are ready when it's time to eat. If you need that morning cup of jo to get your started, set the coffee maker on auto-brew so it’s waiting for you. If you have items to take with you before you leave, make sure everything is by the door in a bag and ready to grab. 2) Focus your morning – The simple act of centering yourself before the day begins is one of the most important things you can do to set the tone for the day. Center yourself spiritually by having time for meditation, prayer and devotions. Then take a moment to center mentally by being thankful. I do this by keeping a gratitude journal. Each morning list 10 things for which you’re thankful. It keeps the lacks away and you’ll begin to see your days in a blessed way. Next, center yourself physically with simple exercise...breathing, stretching, jumping jacks, running in place or rebounding. Anything to get the blood flowing. 10 minutes of rebounding (jumping on a mini trampoline) was included in my morning routine and that simple addition made a huge difference in energy for the day. 3) Eat a Good Breakfast – I know this sounds like common sense, but many of us skip this crucial part of the day. Feed the body and it feeds your brain. By eating a nutrient dense morning meal, your blood sugar levels with be stable, your brain will work better and your heart will love you too. 4) Implement The 7 Daily Do’s – Keep it simple and make a list of 7 things to do for the day. This is a flexible to-do list that can be altered as priorities change. Don't beat yourself up if all 7 aren't completed. Simply include those unfinished tasks as part of The 7 Daily Do's for the next day...no guilt here! 6) Declutter 15 Minutes a Day – When we have cluttered spaces, it clutters our mind. Disorganization distracts and eats up our time. If you have piles of clutter or closets stuffed to the rafters, taking small steps each day will eventually have you seeing the light. Once the 15 minutes are up, put the bins away until the next 15 minute declutter. At the end of the week, put away what’s in the Keep bin, toss what’s in the Toss bin, take the Donations bin to charity and then reevaluate the Maybe bin. Don’t get bogged down in the details. If you’re getting frustrated because something isn't quite working they way you thought it would, step away and come back to it later. 8) Understand Your Work Style – We all have different ways of moving through life. My style and schedule isn't going to work for someone else. Set up a system that works for you. If you do your best work in the morning, make sure to tackle the hard things first and then end the day with simpler tasks. If you’re a slow starter, then begin the day with quick, easy tasks and progress to the more challenging assignments later in the day. 9) Let Go of Perfectionism – Perfection cripples and prevents us from moving forward. Embrace where you are, doing your best is more than enough and let go of the internal critical thinking. 10) Give a 15 Minute Buffer – If you have appointments and errands, leave 15 minutes earlier to give extra time in case the unexpected happens. This will prevent the “rush-abouts” and you’ll feel calm and relaxed for the task ahead. 11) Learn How to Say No – If we’re feeling overwhelmed and distracted, many times it’s because we’re taking on too much. Learning to say no can be one of the biggest favors you can do for yourself and those you love. It helps reduce stress levels and gives the time needed for what’s really important. By incorporating these elements into your daily routine, you'll begin to notice the chaos moving out and the order moving in. I've set up a group board specifically for the 31 Days of Simple Living series. Each day I'll be pinning our posts along with other pins that relate to the daily challenge. You can also post your progress and questions below in the comments section and feel free to join us on Facebook and #31SimpleDays or #31Days on Twitter. Come back tomorrow for our post on how simplify the day with a morning and evening routine. See you then! !